The Twinblock appliance is designed to alter the way the face is growing by encouraging the lower jaw to grow forwards, improve muscle function and correct the relationships of the front and back teeth. They can reduce an overjet (distance the top front teeth stick out ahead of lower front teeth) from 10mm to 4mm in as little as 6 months. Your top teeth should normally be in front of your bottom teeth by 2-4mm. This is called your overjet. 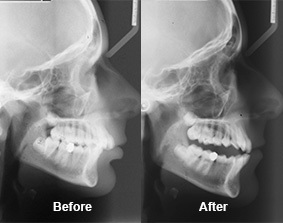 If your overjet exceeds 4mm, a Twinblock appliance is used to bring your lower jaw forward into the correct position. When Should The Twinblocks Be Worn? Twinblocks work by harnessing the power of the chewing muscles and should be worn as much as possible - that is, all the time. It is this constant positioning of your jaws that will ensure the desired encouragement and growth. Please remember that if you do not wear your brace it is only yourself you are cheating. Your treatment will take much longer and your jaw will move back to its original position. We do suggest they are removed when playing contact sports, swimming or playing certain musical instruments to prevent injury to the lips/cheeks. Please keep your brace in its protective box when it is out of your mouth to avoid damage/loss. Should I Eat Whilst Wearing The TwinBlocks? Twinblocks are designed to allow you to eat with them in. This may be difficult at first but will get easier once you are used to them. As the Twinblock is working to adjust your chewing muscles, the more you eat with them in, the faster the desired result will be achieved! The brace should be removed after eating to be washed and so you may clean your teeth. This is to prevent food being trapped under/around the brace which may lead to gum infections or tooth decay. At first your brace may feel uncomfortable, your cheeks may feel sore and ache a little, but this is only temporary. If you wear your braces full time as instructed they will become more comfortable and easier to wear. Your speech may also be affected; this can be improved by reading aloud! It is very important to keep your brace clean - this can be done with a toothbrush and toothpaste, but do not use hot water when cleaning your brace. Sometimes a small part of the brace my break or become loose. If you are still able to wear the brace, do so. Call us as soon as possible to arrange an appointment in which it can be fixed. Larger breakages will mean replacing the brace which will need to be paid for. Look after your braces - If you have had treatment carried out by the NHS, they will not pay for a replacement brace in the event of you losing it. You will be charged for the cost of replacement.